Failure to convert interested leads can impact your bottom line drastically and simultaneously increase your operational costs and decrease your profits. The most common reason for this failure is lack of follow through from a sales team. Did you know that 74% of CRM users said that their CRM gave them improved access to customer data? And that by properly implementing a CRM, a business could shorten the sales cycle by 8 to 14%? 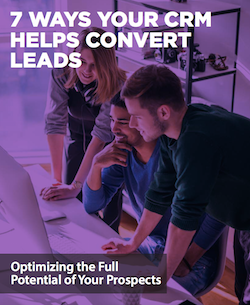 For more reasons on how a CRM solution could help you convert leads, download and read our guide 7 Ways Your CRM Helps Convert Leads.